Location : Earth: Sol System. Image Software : Paint, IrfanView. 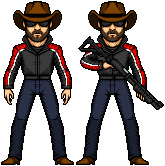 Holy cow what a really awesome job, both version look impressive, well done sir. So there was I on my workplace, with nothing better to do, so I decided to micro out of fun. Nothing serious, but it turned out so good I decided to bring it home and post it. No refs nor templates, only my memory and paint's primary colors. A micro build from zero. Turned out well. Might remake it soon, let's see. My stuff is free for use, credit would be nice, just don't claim them as your own. [03:24:06] * Ghost_Spider turns to lil pengy and dances pengy dance. [03:25:00] Razor Infinity : this is a real kodak moment. Thanks to all those how have made me avvies.... those I could fit on this and those I couldn't. My micros are my own. I credit all those I borrow from, I expect the same policy. Pretty damned cool there GS. Nicely done. I don't have to explain reality. I just have to deal with it. [03:11:45] Daisuke : so what was the idea you had Sever? I loved your Seiya , was very beautiful. I'll even watch the movie , I found myself longing . Thanks for the kind words, holmes! Finally found myself some time for mikroing, which means I'm back in the game, kids! And for my first trick, I'll pull some micros out of my sleeve! Well... Yeah, that's kinda old, so how about pulling a spine out of a body bare handely? Bekause what I'm about to show ya'll is about to bekome a FATALITY! 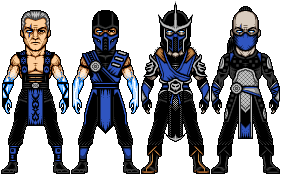 Sub-Zero (MK1, 2, 3, Trilogy, 4, Shaolin Monks, Deadly Alliance, Deception, Armageddon, Vs Dc Universe, 9 and X). 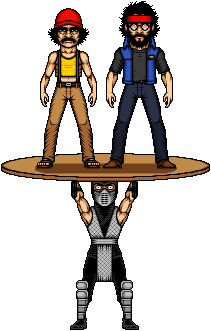 Scorpion (MK1, 2, Trilogy, 4, Shaolin Monks, Deadly Alliance, Deception, Armageddon, Vs Dc Universe, 9, Injustice and X). 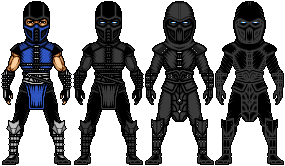 Noob Saibot (MK2, Trilogy, 4, Shaolin Monks, Deception, Armageddon, and 9). Kung Lao (MK2, 3, 4, Shaolin Monks, Deadly Alliance, Armageddon, 9 and X). Most are remakes of my last MK batch, so the only new thing is Kung Lao. Next up is Raiden. I call him Johnny, I use a Bagger bike and mostly Muscle Cars. I like to work as an enforcer and getaway driver. And I favor the shotgun. That's it for the moment, might bring Raiden today or tomorrow. Great comeback Ghost Spider, you take on MK looks amazing!! can't wait to see the improved micros!! Great job all around on the MK micros! Thanks guys. Just fixed them. 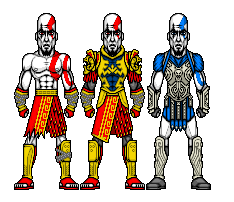 Wow just wow what a fatality job, each one is just so wicked epic, you can really see the different in there outfit details. Fantastic work GS. Glad to see you posting again. Location : Where the Funk is at! Image Software : MS Paint and the Funk machine. Good to see you back, love the new MK stuff. 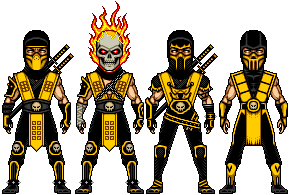 Nicely done, The Noob Saibots are my favorites of the MK batch. All are, as always, perfectly done and incredibly detailed, but what really amazes me are the arms of Johny holding that gun, you have get the position perfectly. Spectacular coming back, Araña Fantasma! Location : Hall of Justice, U.S.A. Awesome work! I really like the Kung Lao. That's some amazing work! Great to see you back! Thanks guys! It's nice to be back. So there was I working on raiden, when I got into the Deadly Alliance/Deception versions (I was microing them in the games order, from MK1 to MKX). I had few ref pics so I halted my work. I'll post Raiden when I finish the whole set (no half done work for me). So, lacking any other refs for any other characters, I decided to make a certain comedy duo with a particular them in their sketches that Ive never seen anybody else trying to micro. Been watching their movies, the first 3 one were awesome, the rest was kinda boring but still I really enjoyed the duo. So, why not give them a shot at microing, right? Random mode on, so be ready for anything from now on, micro-wise. 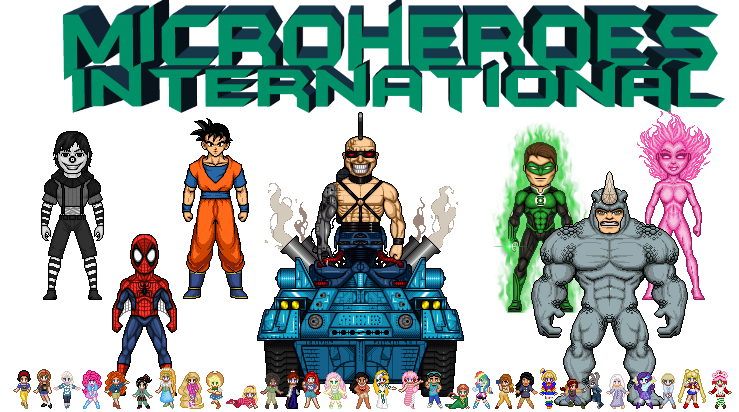 Original micros, but fantastically done! My favorite 1970's Dynamic Duo! Great job on them!